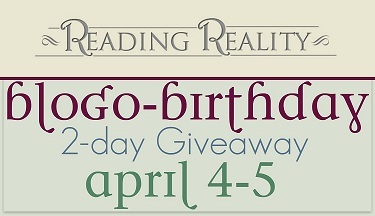 Blogo-Birthday Giveaway – Escape Reality, Read Fiction! I look at reviews to see if I would enjoy it. I love book blogs. Wow, 7 years of blogging? I hope I can keep my blog going that long. Happy blogo-birthday! Congrats 7 years is awesome!!! I like reading reviews of books I have already read so I can compare notes, and I also like random bookish posts that are not reviews! I like an introduction to the read. I can often tell from a few lines if I’ll like the book or not. Congratulations! Reading book reviews and about new releases and features is always special. Congratulations! I look for recommendation lists based on topics and new books and reviews. I love reviews, if it’s a book I’ve read, then it’s always so interesting to see how opinions differ or are similar, and if it’s a book I’m curious about, then it’s really helpful to hear what someone else thinks so I know whether it’s worth the time and money. For me, a mid-length review like on this blog is the best, the overly long ones tend to give away too much information, and one sentence reviews don’t tend to tell me enough about why someone like it or didn’t like it. A review? Usually I want a thoughtful approach that’ll tell me who this book is for. Sometimes that’s not me, and that’s just fine. I look for conversational reviews that don’t give spoilers. I love reading why a reviewer loves or dislikes a book. Congrats!! That’s such a long (and productive) time, it’s really something to feel proud of. I’ve certainly enjoyed my time here, lurking as is my wont (the joys of being an extremely awkward introvert yaay). I enjoy reading people’s reviews when they cite what worked for them and why, because then I can see if their thought processes/pet peeves/buttons are similar to mine and thus if I can find new reads or author through them. And it’s worked, I’ve read and loved many books that I wouldn’t even have found existed where it not for them (and you)! I think easy navigation is important to be able to find the kinds of books you want to read. Congratulations on both milestones! I originally discovered your reviews from the much-missed BLI. We share a fondness for many of the same authors and genres, but I really love it when you introduce me to something totally new and unexpected. Thanks for all your interesting and thought-provoking reviews over the years. I’m looking forward to many more! Happy Blogoversary and Happy Birthday! I usually look for book recommendation lists organized by genre. Congratulations on seven years! I am an avid reader and love discovering new authors. I love looking at reviews. I hate memory loss storylines or dating another woman because it would be safer for the lead heroine. Will not read the rest of a series if that happens. Been burned way to many times and wasted sooooo much money. I love excerpts and honest reviews if its a good read or not. I like pertinent communications and reviews but absolutely hate being spammed constantly with repeat info. I really appreciate arc sharing and contests but hate group contest that automatically subscribe you to many, many authors. Congratulations on 7 years. I like to see a verity of things. Book reviews, Book Tags, Discussion post, and fun author/character post. Have a happy birthday! Congrats on many years of blogging – and best wishes for many more! Reading Reality is one of the first book blogs I ever visited. I like short reviews that don’t go into too much detail. Congratulations! I look for book recommendations and gift card giveaways! Happy, happy, happy blogoversary and happiest of birthdays!! As for what feature I’m most looking for in a book blog – definitely book reviews, upcoming releases, author interviws, book recommendations..
Thanky you for a generous giveaway!! Happy blogoversary and birthday! I think I look for in-depth book reviews. I really appreciate honesty, but I don’t want reviews to ever be mean. I mostly look forward to find book recommendations and reviews of lesser known books, interviews with Indie authors, as well as some bookish tags and memes. I like reviews that are short, but let you know what they like and don’t like about it. I like author interviews and guest posts. And I love reading reviews for books that are new to me, as long as too much isn’t given away. And I like some humor and teasers in reviews too. Happy Blogo-Birthday! 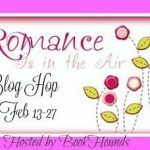 A blog that picks good books and the occational contest. I look for book reviews on a book blog. I like reading author interviews on book blogs. I enjoy reading non-spoiler reviews on a blog. As long as it is thoughtful and gives clearly the opinion, a review is fine for me. I like reading enthusiastic reviews that may me think it may be the book for me, reading the ones that give info that may me think it is or isn’t. It’s pretty impressive that after 7 sevens years, you actually blog more now rather than less. Congrats on your blogversary! I love reviews that tell me why the book worked or didn’t work for the reviewer, rather than just gushing about how great it is. Sometimes, something that is a negative for the reviewer would be a positive for me, so I like all those little details. Happy Blogoversary! I usually like reviews because this way I know how much I would enjoy reading some book. I read multiple reviews, then I purchase the book if it sparks my interest. I think stats and rating different elements can be helpful for the reader — e.g. How many pages is the book?, are the chapters short/long/mix of both, is it an addictive book or is it a good one to put down and come back to later? 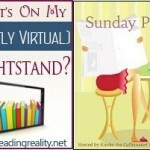 Pingback: The Sunday Post AKA What’s on my (Mostly Virtual) Nightstand 4-15-18 – Escape Reality, Read Fiction!